Some more mercury with your tuna? You are what you eat. While I always questioned this in a literal sense as a child, it is pretty much the case. But I don’t want to be made of heavy metals, and my body agrees. It is no news to anyone that we are poisoning our oceans, and unfortunately that means our food supplies. There has been much talk over the years about the amount of mercury in seafood, and while the studies have thus far been inconclusive as to the extent of the contamination, certain individuals, especially children and pregnant women, have always been steered away from the deep, cold water predatory fish out of fear of mercury contamination. We know that there is mercury in fish, but unless certain species made a bulk of your diet, it was never an issue if you ate of them sparingly. That may be no longer the case. Media fear mongering being what it is, making a gross generalization about contamination is sushi is ridiculous, but it is prudent to be aware of the potential health issues with eating certain sushi items, and it seems that tuna may be worse for us than we realize. Mercury is naturally present in seawater, but modern industry has increased those levels exponentially, and as it is absorbed by plankton and other creatures that encompass the base level of the food chain. Heavy metals also concentrate as they work their way up the chain to the larger fish. 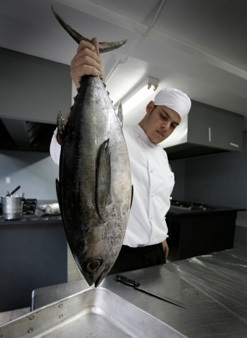 Now, according to a recent study, mercury concentrations have reached potentially unsafe levels in bluefin tuna. With some of the tuna tested, it was found that by eating six pieces per week (or even two or three pieces per week of some samples), which is not unheard of, a person would exceed the mercury levels determined by the FDA as being safe. That’s no fun. Contamination has become a very real problem, and I definitely think that children and pregnant women would do best to completely avoid bluefin tuna (and even ahi, yellowfin tuna, just to be safe) until we can be assured of the safety of the food supply. This is not something that can be fixed overnight, either, especially as no single nation seems to be willing to step up to the plate to reduce pollution in any form. Frankly, there is another reason to not eat bluefin tuna, as I have pointed out in numerous entries in the past (Trouble for Tuna I, II III, and IV), the fish are in very real danger of being wiped out due to over fishing. 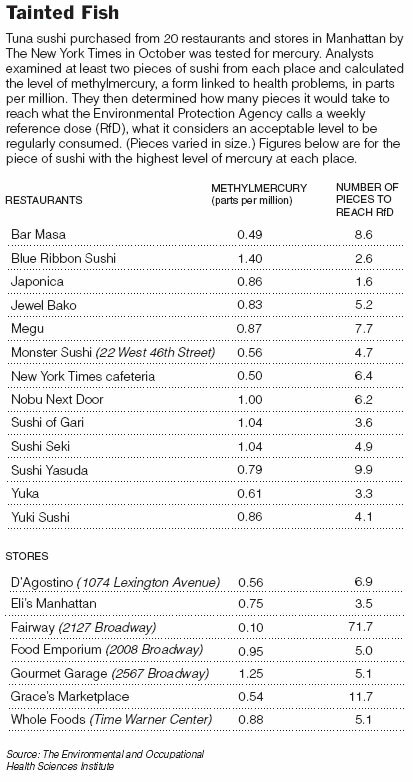 Perhaps the silver lining of the mercury issue will be that people will eat less, and the fish may be offered some time to recover from their predicament. There are still many sushi items available for you to enjoy, even for those whose preference was maguro (tuna). The toro lovers may have more to be sad about, but with the variety of seafood available, hopefully even they might be placated by minimizing their intake of toro and expanding to other buttery selections such as buri toro and ‘white tuna,’ which is usually not any form of tuna anyway. Tuna has been out of my rotation for some time, and with these new data it seems that we should all take a hard look at what is on our plate. Be moderate with the predatory fish such as tuna, tilefish, swordfish, shark, and even salmon, and treat yourself to some new sushi items that you may have been eyeballing, but haven’t tried because you were happy with your spicy tuna roll. There is a lot out there and now is your chance to expand your repertoire. It is too bad that we have ruined what is a staple for many sushi fans, but at least I still have my spicy scallop roll. Well, I agree that we should eat pelagic predatory fish in moderation though mercury does exist that does not mean in complete abstaining from eating them. Secondly, we should try to eat more other variety and be daring enough to try other species. Beside it is better to eat everything in moderation. The green enviromentalist and the veganist blown out of of proportion the mercury issue. They pushed the agenda so that people will be chased out completely from eating them.